Are you looking for a Vietnam motorcycle tour which doesn’t take too long time can offers you a full view of stunning scenery in the north of Vietnam, historical sites along the legendary Ho Chi Minh trail, colorful culture and beautiful beaches and coastlines in the central Vietnam? This 12 Day Motorcycle Tour Ho Chi Minh Trail is a good choice for you! At around 8:30 am, The Ho Chi Minh Trail Motorcycle Tour starts from the western outskirt of Hanoi. 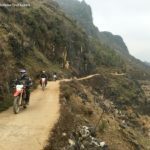 With other people, the first day is difficult day but for us the first day ride to Mai Chau is the highlight of the trip and must be the best Vietnam motorbike tour today. We head up to the west of Hanoi on the free way where the traffic looks busy but you can have safe motorbike ride to move out of Hanoi. After just about 1 hour ride, we will be in the mountain area of northern Vietnam where we can enjoy an interesting motorcycle tour in North Vietnam through some peaceful villages on the back-roads that offer you amazing view of green mountain and rice fields, and remind you about Halong bay. Arrive Mai Chau at about 5:00 pm, stay with the white Thai people on stilt-house in Mai Chau. After breakfast with the family, we get back on the bikes and motorbike through Mai Chau and then get on the Ma river bank and enjoy a beautiful motorcycle ride through bamboo forest along the winding river bank. We will get to Ngoc Lac town at noon time when the lunch is served at the local restaurant. After lunch, just enjoy an easy and relaxing motorbike tour on Ho Chi Minh road to Tan Ky town. Stay in a guesthouse in town. Tan Ky is known as the starting point of the Ho Chi Minh trail during the war time. From here the Northern communist with food and weapons travel down to the South Vietnam to join the war. 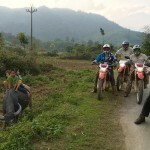 After breakfast, we travel down to the South Vietnam with our motorbikes on the historical trail. The ride is almost on the repaired part of the trail but still offers a great view of mountain and the daily life of the local. The motorbike ride on Ho Chi Minh trail in the afternoon must be the highlight of the trip. It’s another highlight of this Ho Chi Minh trail motorcycle tour! After departing from Phong Nha town, we will make a turn to join the western Ho Chi Minh trail; known as the hidden trail that the US army did never know and bomb, the western Ho Chi Minh trail offers us the wonderful motorbike ride today: with the length of more than 200 km, this western Ho Chi Minh trail motorbike ride is almost under the Phong Nha Ke Bang national park where the traffic is completely empty. In the late afternoon when we get out of national park we will pay a interesting visit to Khe Sanh – the former important US Marine Base including US Air base, tunnels and new Khe Sanh museum. We will head down to the Khe Sanh town and finish the great day for motorcycle touring Vietnam at about 5:00 pm. We will leave the Ho Chi Minh trail today to ride along the historical road No 9 along the Dakrong river. The motorbike ride is straight to the eastern side of Vietnam along the 17th parallel where we can visit the Hien Luong bridge – a symbol for the border between the north Vietnam and south Vietnam, Vinh Moc tunnels and where you can have short motorbike ride on coastal roads which offers different view from the ride on Ho Chi Minh trail days before. We arrive Hue at 4:30 pm. Hotel stay. After the western breakfast in the hotel, you can choose to discover the hidden charm of Hue by bus tour around Hue or take a short motorbike tour in Hue to some beautiful temples, king’s tombs or rustic and peaceful villages. After lunch you can have swim on the beach or enjoy free and relaxing time after a long ride. Dinner is on your own, fell free to discover the Hue cuisine. Hotel stay. After breakfast in the hotel, we will have short walking tour around the ancient town Hoi An to see some famous attraction in Hoi An such as: the Japanese bridge, Chinese temples, local markets and the traditional houses. In the afternoon you can have your free time at the beach or keep motorcycle touring Hoi An to some peaceful and green villages of the local people who plant the vegetable all year around. Hotel stay. The Ho Chi Minh trail motorcycle tour today is another busy day with a lot of visits and stops. Firstly we pay avisit to village of the Bana people and then keep motorbike riding to Pleiku where we can enjoy the scenic landscape and the natural lake calls “the Eyes of Pleiku” Sea Lake. Visit rubber plantation and learn what the locals do for a living. Stop at Ede ethnic minority village to experience pleasure with their unique culture,…etc. We will finish the day at about 5:00 pm in Buon Me Thuat town and stay overnight in a hotel. The last day of the Vietnam Motorcycle Tour on Ho Chi Minh trail is a big day with plenty of stops for picture of the green mountain lake, colorful hill tribes and the beautiful coastlines. Firstly, you can ride elephant or boat to pass the Lak lake to visit M’nong’s village and then enjoy the beautiful motorbike tour on coastal roads to Nha Trang. We will pay some visits to the natural hot water springs, friendly K’ho people, the colorful Cham or some fishing villages. We will be at Nha Trang at 4:00 pm, check in the hotel of your choice, say good bye to the friends of Vietnam Motorbike Tour Expert then enjoy your relaxing time in the coastal city of Nha Trang. Please contact and tell us which kind of bikes you would like to ride and how many people in your group then we will give you the right price of the tour! What A Wonderful Vietnam Motorbike Trip!